Serve this fresh fruit cobbler when colder weather arrives. 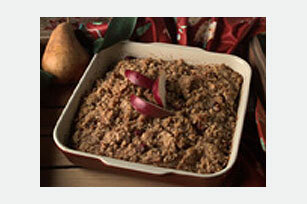 Warm and comforting with a golden biscuit topping, it will scent the house with cinnamon. Preheat oven to 375°F. Mix apples, 1-1/4 cups sugar, the cranberries, tapioca and cinnamon in large saucepan. Gradually add water, stirring until well blended. Bring to full rolling boil on medium heat, stirring constantly. Pour into 2-qt. baking dish. Dot with 2 Tbsp. butter. Combine flour, 2 Tbsp. sugar, the baking powder and salt in large bowl. Cut in 1/4 cup butter until mixture resembles coarse crumbs. Stir in milk until mixture forms a soft dough. Drop by tablespoonfuls onto hot apple mixture. Bake 30 min. or until topping is golden brown. Serve warm. Prepare as directed, substituting pears for the apples.